Delegate Cory McCray (D-45) is challenging incumbent Senator Nathaniel McFadden. Freshman Delegate Cory McCray (D-45) is challenging long-time Baltimore City Senator Nathaniel McFadden and has released his first campaign video. Folks, if you are going to watch only one campaign video all year, this should be the one! Next Saturday, freshman Delegate Cory McCray (D-45) is holding a campaign event in which he is expected to announce a challenge to long-time Baltimore City Senator Nathaniel McFadden. It’s a gutsy move that will be one of the marquee races in the city. The Baltimore Sun and Maryland Matters have both covered the impending race. We reprint McCray’s announcement below. 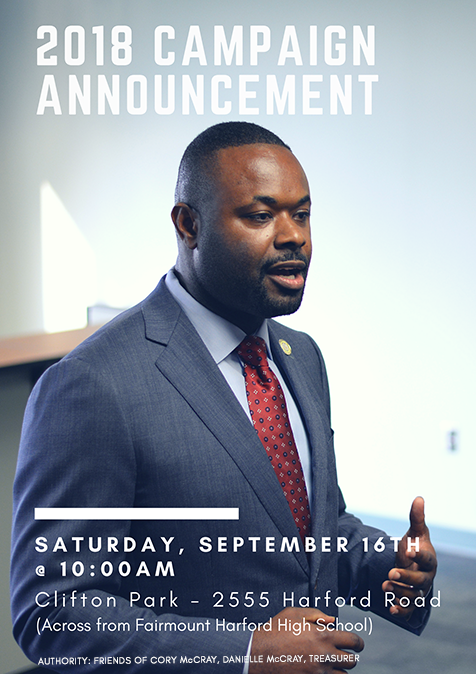 When: Saturday, September 16, 2017 @ 10:00 A.M.
Why: Baltimore is a strong community filled with potential, and we deserve political leadership who will help turn that potential into a reality. Growing up in Baltimore, Cory could have easily become a statistic. He changed his life when he found an opportunity to do better. He wants to provide those same opportunities to the residents in the 45th district. Though the challenges Baltimore faces are significant, Cory is prepared to deal with those challenges head on. Baltimore is a town that has passion and determination to push through these difficult times. September 16th, Cory will make an announcement regarding his plans to fight for the community that raised him. The 45th district deserves a leader who will listen and provide services to improve the quality of life, where the community are partners in progress. Cory McCray, is a husband, father of four, union electrician and, he’s willing to make the hard choices necessary to begin the healing in Baltimore. Here are a few early reactions to Governor Hogan’s State of the State address earlier today. Marylanders won’t stand for balancing the budget on the backs of our children. We should be concerned about the cuts to higher education which will increase tuition for our students, cuts to Medicaid which will have an adverse effect on our vulnerable families, and the 2% salary reduction to State Workers who are our neighbors, our friends, and our family. We agree with the Governor that people feel a real disconnect between Annapolis and the rest of Maryland, and we believe that special interest influence in elections and a broken redistricting process are fueling that divide. We look forward to working with him on these critical reforms. After striking a partisan tone in his State of the State, Governor Hogan today outlined a series of tax cut proposals without explaining how he plans to pay for them. To me this raises questions about the administration’s commitment to reining in the long-term structural deficit, and the announcement seems strangely timed given that the Governor has signaled his first priority is to bring our fiscal house in order. There are obviously tough choices that will need to be made in the coming session, but our county’s first priority has been and remains restoring school funding and keeping the Purple Line on track. This is not an appropriate time to be considering further reducing the state’s revenues, when we’re deleting hundreds of jobs in our school system. 1. Cory McCray – As far as I’m concerned, there is not a single person in Baltimore (or Maryland) who doesn’t think Cory McCray will win a seat in the legislature on June 24th. One incumbent actually dropped out to avoid facing him in the primary–and I don’t think anyone blames her. Cory has been a recognized leader in the IBEW for years. He’s also infectiously charming. Future Mayor? 2. Dy Reed – The eternally savvy in-house lobbyist for the Maryland Department of Human Resources. Currently in law school at the University of Baltimore, she attended Columbia University for undergrad. Incredible potential. 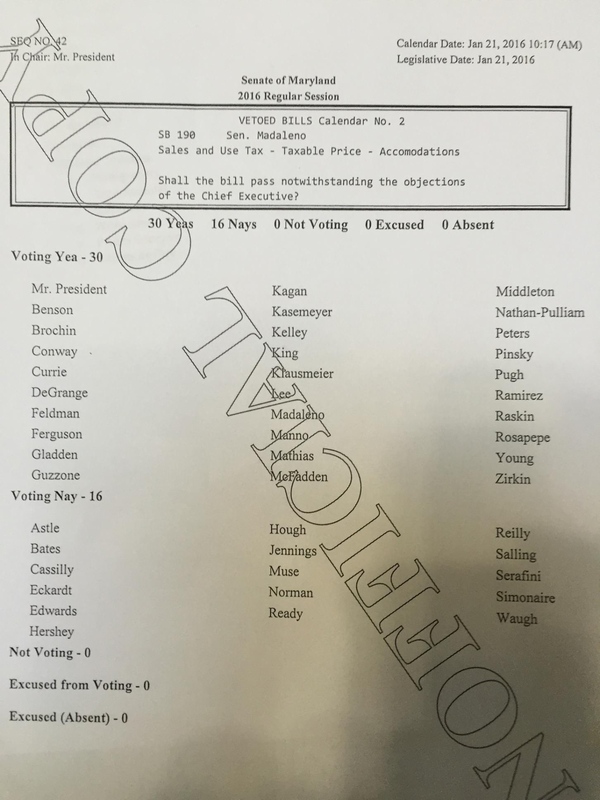 Anonymous: When Dy isn’t lobbying in Annapolis in her official capacity as government relations rep for the Maryland HR, she is one of the most active members of the Baltimore City Young Dems. Dy was also recently recognized for her work in Baltimore by the B.E.S.T. Democratic Club. 3. Brian Hammock – I’m reasonably certain that Brian was the youngest statewide field director in the country in 2006 when he oversaw the ground game for O’Malley’s first statewide run. After a stint in the Governor’s office, he’s practicing law with Mid-Atlantic powerhouse Venable LLP. He’ll be an insider from city hall to the statehouse until the day he dies. 4. Matt Stegman – The nicest, funniest dude in Maryland politics. With a resume that includes lots of real races both in Maryland (O’Malley and Kratovil) and in more competitive states (Ohio and Pennsylvania). he currently works for House Environmental Matters Committee Chair (and contender for the Speaker’s Chair) Maggie McIntosh. At night, he goes to the University of Baltimore Law School (a.k.a. finishing school for lobbyists). Anonymous: Like his boss – smart, progressive, & has the best sense of humor in Annapolis. 5. Liz Richards – Liz is a former DSCC independent expenditures staffer who is currently managing Brooke Lierman’s surefire delegate campaign in District 46. I fail to see how they lose that race, and Liz should be well positioned to capitalize on the victory. 6. Benjamin Smith – The Student Government President at UMD Law School is already a published author (the book was about community agriculture). He has 2018 written all over him. Kentucky native but looking to move up in Charm City. Anonymous: Ben recently moved to Maryland to attend law school, and he has quickly asserted himself in the political community. Ben makes no secret that he holds deep political ambitions in the state of Maryland, and in Baltimore, in particular. Look for him to make a run for elected office shortly after he graduates law school and passes the bar. 7. Anthony Jones – This Baltimore City native and Martha McKenna protege previously worked for US Senator Ben Cardin and Comptroller Peter Franchot. Someone to have on your side in the upcoming 2016 municipal elections. 8. Tashea Brodgins – Currently, she works at the Department of State and was previously with the Executive Office of The President. Tashea was the President of the Baltimore City Young Democrats for five or six years–A remarkable run for an organization known for high turn over–and remains tied in locally as a member of the City Central Committee.